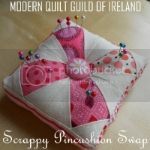 It seems like there are lots of people interested in our Scrappy Pincushion swap, which is fantastic news. We have a great little group over on Flickr. But I know that a couple of people haven't had a minute to do the signups, and obviously we'd love to give as many people as possible a chance to join. Happily, we're not under too much time pressure on this one, so I'm extending the signup deadline to Monday evening 26th August to give everyone a little more time :-) If you've been sitting on the fence, please do join us, it won't take too much time, and it will be FUN! To join in, just add your name to the sign up list in the Flickr group, and fill out this form so we have your details to give your swap partner. If you're not a member of MQGI, please take 2 minutes to join us by filling out the registration form here.